I adore this one-man band to death. 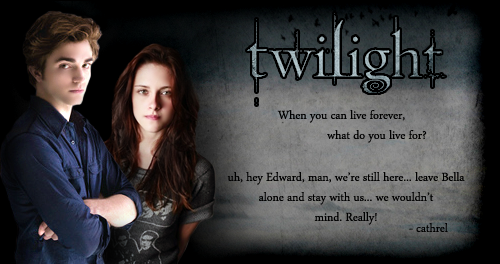 His work is purely Twilight-inspired. His lyrics are sometimes hilarious and some, unbearably sweet. One of my favorite song is probably She is Brighter -it's a song about Alice. It doesn't really mention her name but when you listen to it you can tell that the song is about her. Location : Transylvania, visiting Uncle Draco. OOhh.. interesting. Can you give us a link or something for us to know this band. oh yes of course Cathrel. » Autumn Splendour on forma with yellow/gold band ?? ?